Summer’s fast drawing to a close, but I wanted to share this recipe with you anyway in the off-chance you have the opportunity to get to the last of this season’s stonefruit. What a summer for stonefruit it’s been, too – I don’t know if it’s just me, but I feel like I’ve been eating my way through a mountain of perfectly ripe, incredibly juicy, sweet, dreamlike fruit. Peaches, nectarines, plums, yellow, purple and white, I’ve eaten them all. And with hardly any duds, either – you know how you sometimes get those peaches or nectarines that you bite into and immediately throw out because they’re just mushy, or mealy, or kind of dry and not-sweet? Yeah, hardly any of those. It’s been a really good summer. It’s been a really good summer in other ways, too – lots of hot sunny days, more sea swimming (in frigid Cook Strait, no less!) than I’ve done in all 8 previous Wellington summers combined, learning to surf*, lots of general lazing about. I can’t even remember the last time it rained. ** And I know, it’s officially autumn now, but the sun’s still shining and I’m still going for swims after work; I’m trapped in this glorious time-bubble thinking it’s still late January. So it’s surprising to go to the supermarket and see that the berries have mostly disappeared, stonefruit is dwindling (or, at least, going up in price – a sign of diminishing supply), new season apples and pears have taken over the fruit section. 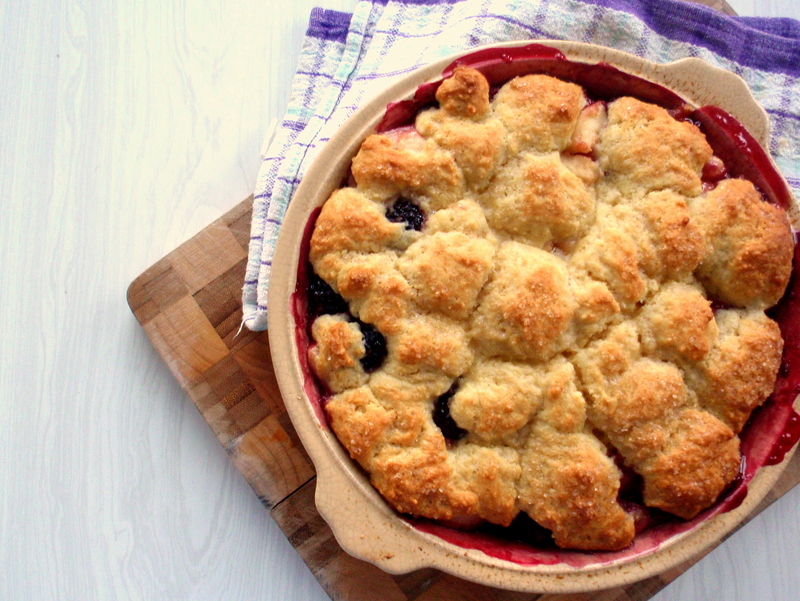 So: before it’s too late, before I have to wait a whole 10 months to post this recipe again, here is this cobbler recipe I put together for the good folks at Urban Harvest. 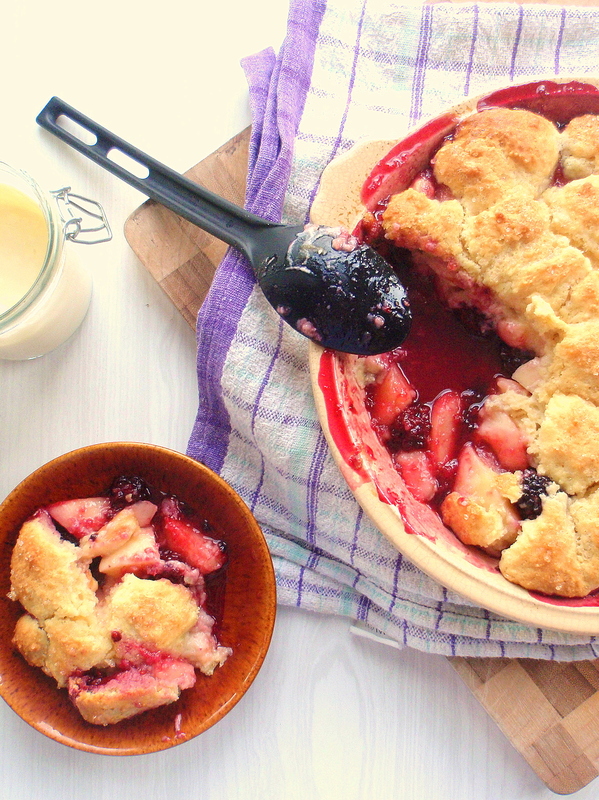 Cobbler is great because it’s easy, it’s pretty (just look at those bright-coloured juices bubbling their way through the gaps in the scone-like topping), and it’s just different enough from the usual (in New Zealand) fruit crumble that it feels kind of special. 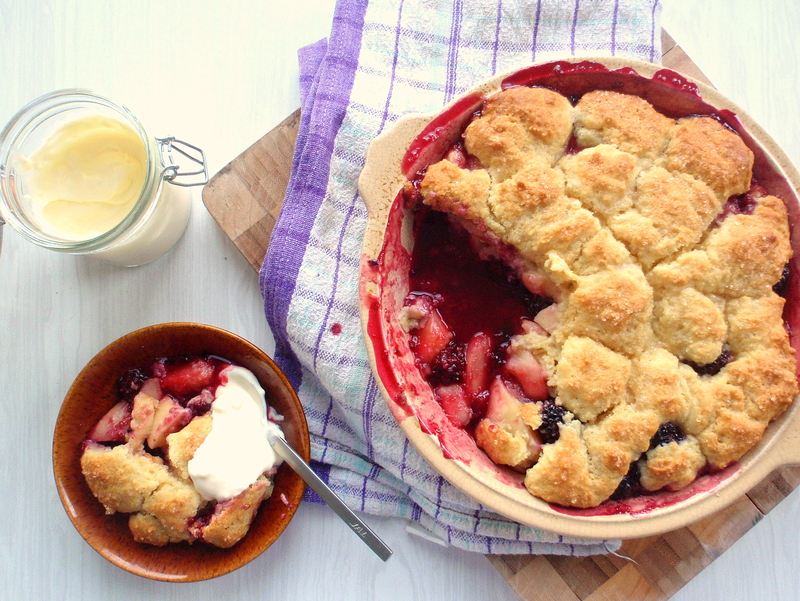 And if you wait too long to make this and you’ve missed the stonefruit season, fear not: you can make this with pretty much any fruit, just as you would a crumble. First prepare the filling: peel the nectarines (to peel easily, blanch in boiling water for about 45 seconds then plunge in cold water before peeling) and slice into wedges. Combine nectarine wedges with blueberries, sugar, lemon juice and zest, and set aside. For the topping, sift together all dry ingredients, then rub the butter into the flour mixture using your fingers, until you reach a crumbly, sand-like consistency. Mix in the yoghurt until you get a soft dough. Put the fruit into an ovenproof baking dish. Tear off bite-sized chunks of dough and place on top of the filling. Sprinkle demerara sugar over the top. Bake for 40-45 minutes or until the top is golden and the filling is bubbling up at the sides. Serve with ice cream, cream or yoghurt. **and, yes, now we’re in the middle of a pretty rough drought, and I know I shouldn’t be boasting about so much consecutive sun, but it’s so rare for Wellington that it still feels novel and exciting to me. Not so great for farms and vegetable gardens though. I’ve taken to drinking a lot of coffee on the weekends. The lifesaver comes in the form of Nigel Slater’s really handy book Real Fast Food and a recipe in it called “tomatoes fried in butter and sugar” or something like that, which immediately appeals to me for two reasons: 1) I have all the ingredients, having just bought a punnet of cherry tomatoes at the vege market, and 2) it’s called “tomatoes fried in butter and sugar”. Oh, also it takes just two minutes to make, according to the recipe. Excellent. The problem is, I’ve got the empty-stomach caffeine shakes and I feel like I need to eat with these tomatoes some kind of substantial carb to settle me down, and I’ve got no bread (I’m kicking myself for not buying a loaf earlier, but what can you do). I do, however, have spaghetti and with that realisation I put down the book and get to work. 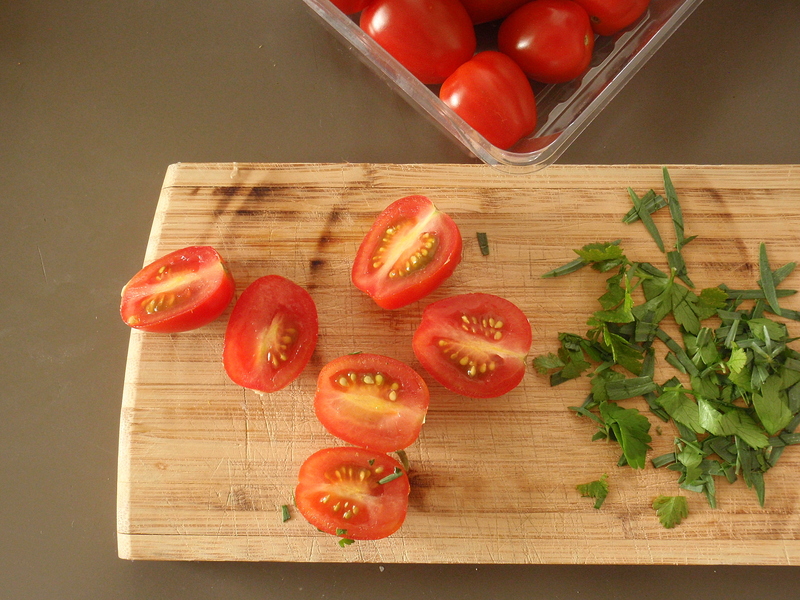 Nigel’s recipe is really simple – to paraphrase: fry some tomatoes in butter and sprinkle a bit of sugar over at the end – but I feel like adding a little tarragon and parsley from the garden because I can. I add a little anchovy paste too, mostly because I’m excited about the lovely old-fashioned tube it comes in, but also to add a bit of extra oomph, because I can. 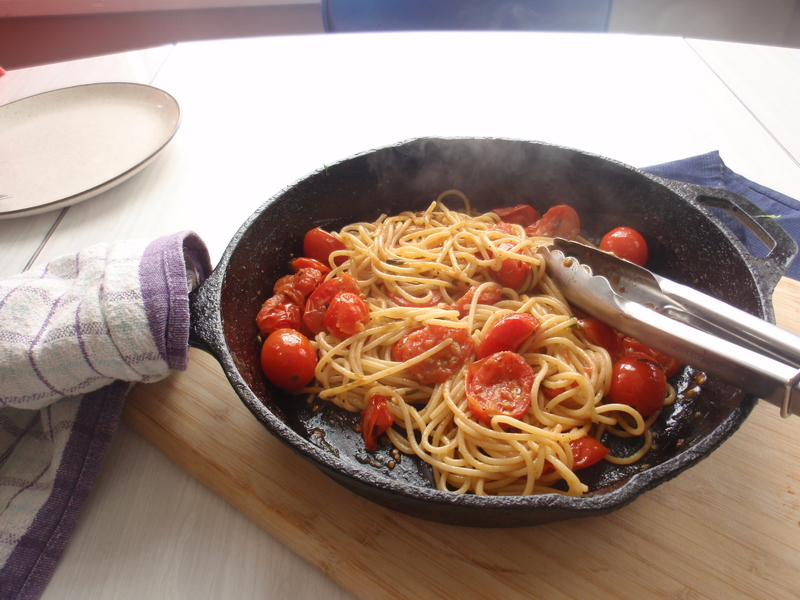 I add the spaghetti to the skillet with the semi-saucy tomatoes and eat most of it out of the pan before changing my mind and transferring the rest to a plate (I really have no idea why. It tasted great either way). 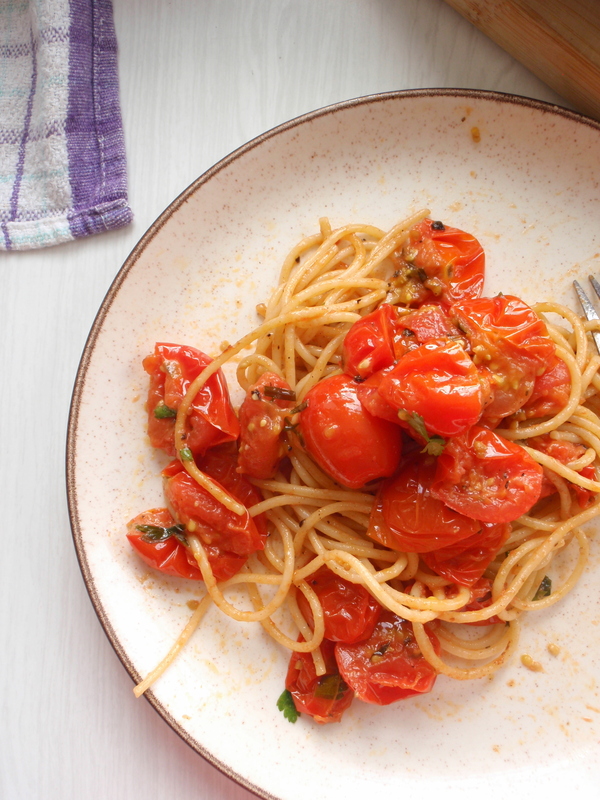 My cherry tomatoes were mostly really big so I cut them in half, but if you can leave at least some of yours whole I recommend you do it: the whole ones sort of burst as you pierce them with your fork and spill their juices all over the mouthful of spaghetti you’re about to take. It’s glorious. The sugar gives it this sort of gentle sweetness reminiscent of slow-roasted tomatoes, and the softly sweet tarragon brings this out even more. And if you cook your pasta just a little past al dente then it almost becomes like a grown-ups’ version of tinned spaghetti. This is something I totally can get behind. The best part about this meal? It was ready in the time it took to boil the jug and cook some pasta, and that’s really great when you’re shaky and hungry and must-eat-something-now. It’s super easy but I’ve posted some instructions below, for those who’d like a bit of guidance. Bring a pot of water to the boil (make sure you use plenty of salt) and chuck some spaghetti in there. In a skillet or heavy-bottomed frying pan, melt two or three tablespoons butter over medium-high heat until foaming. Add some chopped tarragon (I used about a teaspoon worth but you could easily use a bit more) and about half a teaspoon (or more) anchovy paste*, fry for a few seconds, then add 250g cherry tomatoes. Cook for a couple minutes or until the spaghetti’s done. 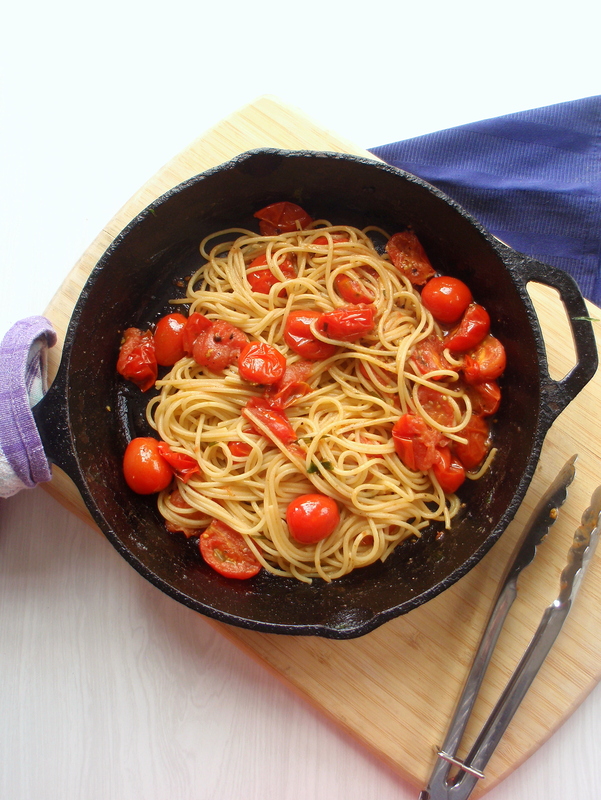 Reserve some of the pasta cooking water in case you need it to loosen up the sauce; drain pasta, add to the pan with the tomatoes, toss to coat. Add a bit of parsley before serving. Serves 1 but can easily be doubled or tripled as needed. *You can easily omit the anchovy paste and make this dish vegetarian, if you’re so inclined.